Petoskey Stone Wine Stoppers are metal wine stoppers with a 2″ to 3″ diameter polished Petoskey Stone attached to the top. The total length of the wine stopper is about 5″. The coloring is a light and dark gray with excellent markings of the coral. The Petoskey Stone is “THE” state stone of our beautiful state – Michigan! A real jewel for any wine lover! Choose a Petoskey stone wine stopper for your favorite wine or give it as a gift. Choose a round mushroom or a flat circular shaped Petoskey stone as shown on the left. 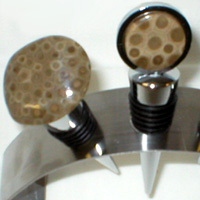 Due to the uniqueness of the Petoskey Stones, no two wine stoppers are identical. A Petoskey stone wine bottle stopper is perfect for a housewarming or hostess gift. Also makes a beautiful and unique gift for groomsmen, bridal shower, birthday, fathers day, retirement, anniversary, or new job. Would like to order wine stoppers with Petoskey stones on top for gift out of state. Do these include information about the Petoskey stone history/origin? Hi Camille – the artisan will include a description of the stone on any order, just note that request in the comment section at checkout.